It did so in 1998, launching the Victory brand, and it was largely successful throughout the naughties. The American conglomerate has also shown isn’t afraid to say when new things aren’t working either, when it decided to pull the pin on Victory early in 2017. 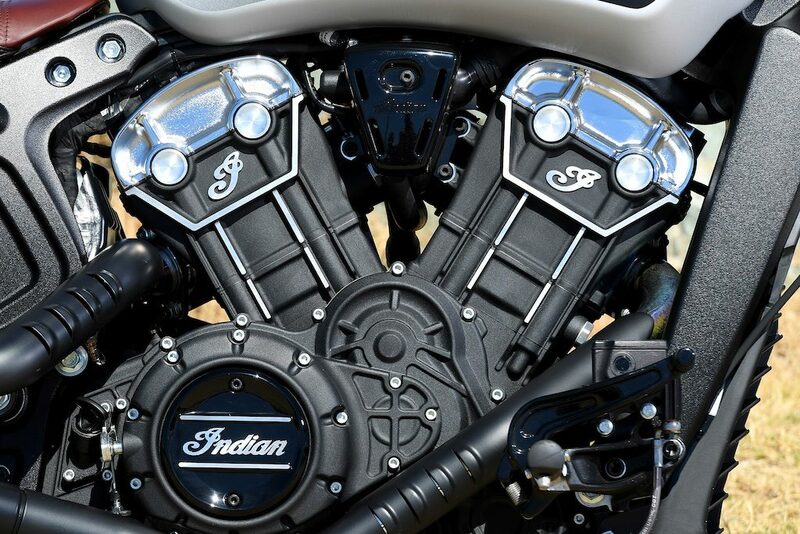 Part of the reason for that closure was the strong performance and growth potential of Indian Motorcycle. Yep, Polaris did that too. It bought America’s oldest motorcycle brand in 2011 and had cruiser riders swooning by 2014 with its big Thunder Stroke 111 V-twin engine and a line-up of very authentic-looking Chiefs. The Indian Scout, a classic-styled middleweight arrived in 2015. It is aimed at those who love what the brand represents. The Scout package is built mainly for urban boulevards and their surrounding regional areas. Polaris released a machine similar to the Scout in in 2016, the Victory Octane. Marketed as a middleweight performance cruiser and targeted directly at a younger market than Indian, Polaris didn’t get the chance to see this project mature. Despite the Victory closure, part of the Octane’s ethos lives-on in a new variation of the Indian Scout for 2018, the Scout Bobber. The styling is ‘modern Indian Motorcycle’, the riding position is more aggressive than a Scout. It focuses on the current trend of minimalism and the experience of riding a cruiser. 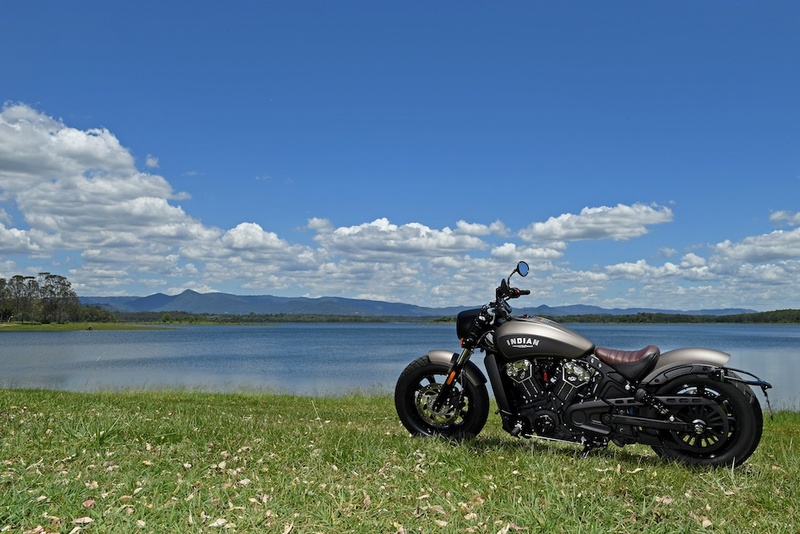 Since Indian Motorcycle’s arrival, the Australian market has taken up ownership quite fairly. 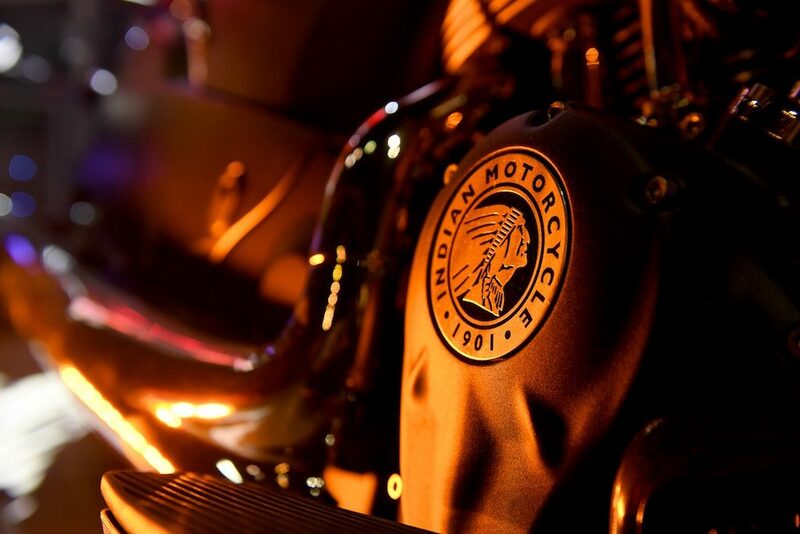 Over 1000 motorcycles were sold in the first two years of production. In 2017, Indian is one of three manufacturers enjoying sales growth in a tough climate. My opinion has been pretty clear. I think part of that success is due to the fact Polaris has made some tough decisions. In a roundabout way it knows what the market doesn’t want and with the Indian Motorcycle brand, buyers aren’t overwhelmed by choice. Indian’s Country Manager, Peter Harvey confirmed this to a degree. Whenever anyone raised the idea of more from Indian Motorcycle, he was quick to knock it on the head. Don’t expect a flat track-style machine in Australia. And don’t expect an Indian-made Indian learner machine any time soon. What about now? What would an Indian Scout look like had America’s oldest motorcycle manufacturer continued past the 1950s? More importantly, what would it look like if riders chopped and changed things? 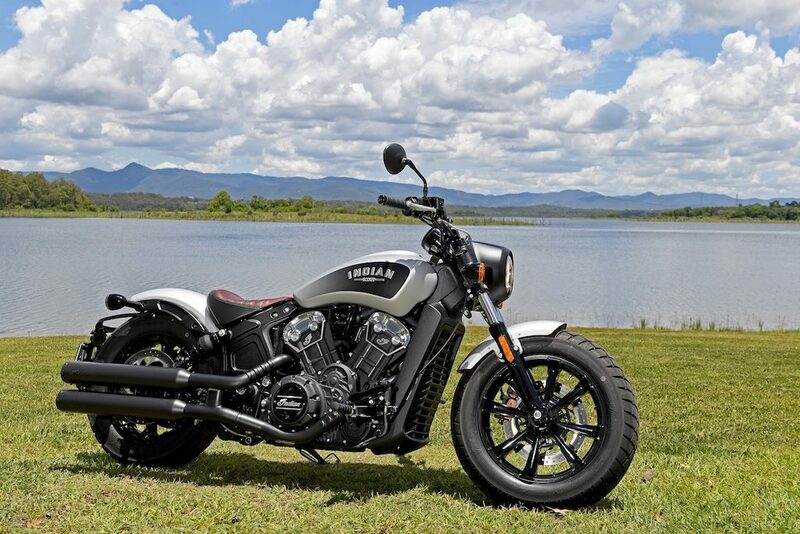 That’s the direction Indian has taken with its Scout Bobber, joining an ever-growing list of manufacturers in the space. So how does it stack up? The Scout Bobber is $500 cheaper than the Scout, but it’s actually one kilo heavier… Can you believe that?  Love the look: shortened fenders, bobber lines, two tone leather saddle, blacked-out with minimal chrome detailing. Essentially, both the fenders on the Bobber have been chopped, making it the solo machine in the line-up (the Scout is now a two-seater as standard). Where is the extra weight? It wasn’t specifically addressed at the launch but it appears to be in the Bobber’s blacked-out eight-spoke wheels. 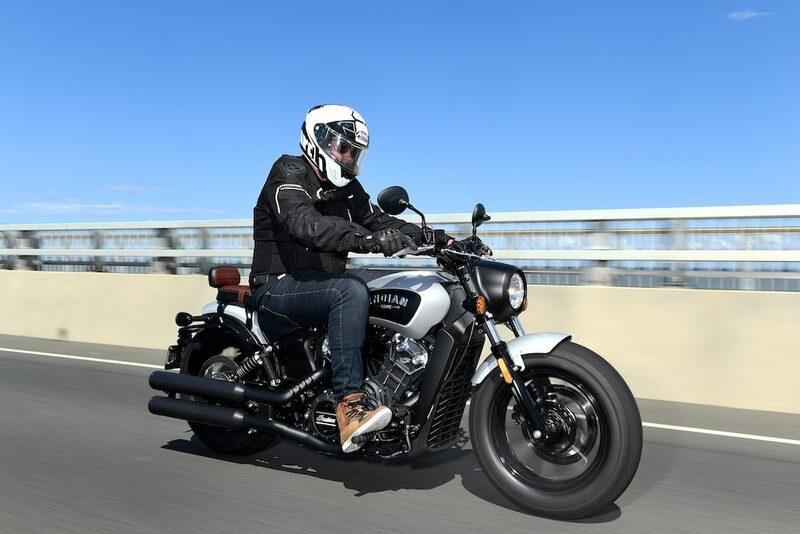 There are a few other differences between the Scout and Bobber, too, like the seat, tyres, handlebars and footpegs, but they’re part of the bobber styling exercise, which is to create a more aggressive, modern-looking machine. The single instrument cluster is a mix of an analogue speedo with a cycle of information available through a digital interface. 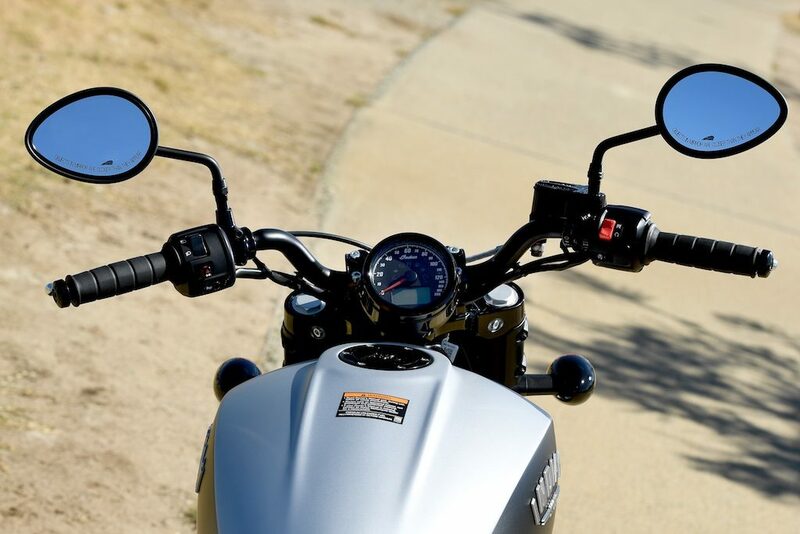 I’d ditch the Australian-spec mirrors for ‘bar-end jobbies; solo instruments complete the minimalist cockpit. 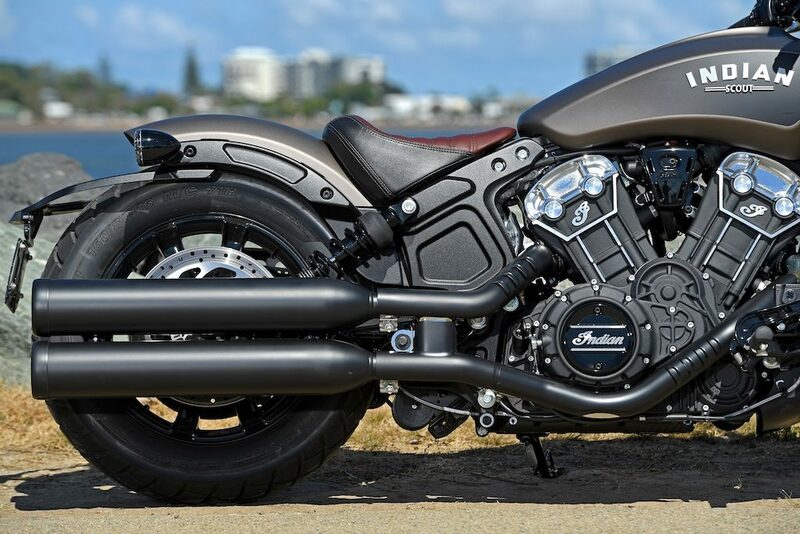 While I particularly like the styling, it would have been nice to see Polaris/Indian Motorcycle engineers use a bit more creativity in the Bobber’s production process. Could they have done more like hide the rear shocks? When you look at Triumph and Harley’s bobber-styling efforts the answer would have to be yes. However, plenty of attention has been focussed into the fit and finish. The two-tone leather bobber-style seat is simply beautiful. The gradient in the paintwork on specific colours is very tidy. The plumbing and cable-routing is well-hidden. Modern technology is integrated with vintage authenticity. Overall, visual design is A-plus. The more you look at it, the more detail you notice. 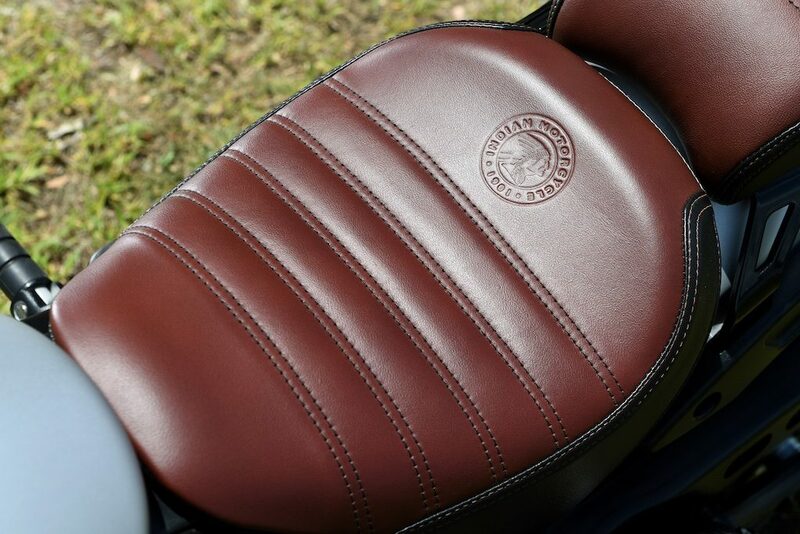 Indian Motorcycle’s leathercraft is better than most. Throughout the launch we spent an afternoon finding out about Indian’s 2018 models before being whisked away to a TripleM gig at Smoked Garage – a custom-shop in Fortitude Valley which moonlights as a killer after-hours space. 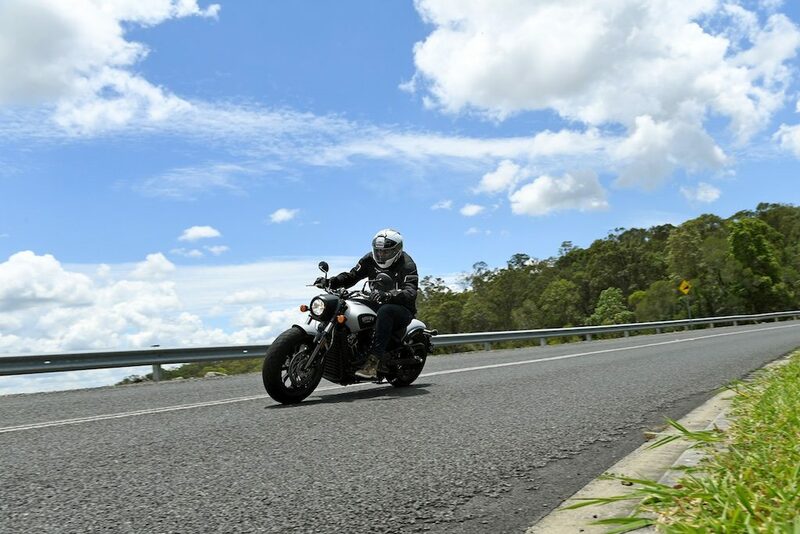 The ride itself was around a 150-kilometre loop which started out at Indian Motorcycle’s Fortitude Valley dealership. From there we rode northwest to Dayboro for lunch, then rode east to Redcliffe esplanade, finishing the ride back at the dealership. The ride itself was a mix of city and country roads, with the quality of road surface high for the most part. Indian showcased its 2018 machines at Smoked Garage. The crown jewel of the Scout Bobber for me is the engine. The 1133cc V-twin configuration provides plenty of torque, while taller gearing and near enough to 100 horsepower provides a well-balanced experience. I found higher gears could get bogged down ephemerally if you asked too much, however knocking it back a cog and winding the gears out really allowed the engine to have its head. The Scout engine is lovely to use. Indian Motorcycle had a unit fitted with a Stage-1 aftermarket slip-on. I doubt there would be huge performance gains but the bottom-end did feel a bit nicer and the throatier sound of the slip-on is always welcome in my books. Aftermarket pillion seat, Fox rear shocks and Stage 1 exhaust shown. Is the suspension up to task? Since the Scout was launched back in 2015, Indian Motorcycle has continually refined the front suspension. The major criticism up to 2017 has been the softer front suspension set-up had a tendency to dive under braking. For 2018 the Scout and Scout Bobber receive cartridge forks instead of conventional damping rod forks. Indian brought a 2017 Scout (with damping rod forks) along to ride back to back to feel the difference. Both felt pretty stable under brakes and coped with the mostly good road surfaces without issue. However I expect the upgrade to a cartridge design should improve the front suspension in a variety of conditions. The rear suspension on the Scout Bobber only has 50mm of travel which is mostly due to the low, bobber styling. Don’t expect a lot from the twin rear shocks in terms of respite, but damping is quite fair considering they are only adjustable for preload. I occasionally experienced some topping-out whilst riding hard over crests, which I’d expect, and the standard preload setting (about a quarter in) didn’t bottom out from hard hits or squirm from mid-corner bumps (not that there were many to sample). Overall I found the ride was very settled, and very impressive considering there’s not a lot of travel to work with. Indian Motorcycle also had a Scout Bobber fitted with aftermarket Fox shocks. Mark Hawwa from Throttle Roll rode it before me and wound up the preload. The spring was as tight as cat’s arse but I found the ride became much sportier. As a result, feedback and handling improved. After that experience, I reckon you’ll need to be pretty critical setting preload if you want the most comfort from the rear boingers. The key is to prevent bottoming-out on hard hits. If you like to ride with a bit spirit, like Mark, you can pretty well set it as firm as you like. My initial concern with the Scout Bobber’s handling was the front end – a 16-inch wheel with a fat front tyre generally doesn’t inspire loads of confidence for someone who hasn’t ridden lots of cruiser-based machines. In the real world the raked-out steering geometries means the smaller wheel still tips in and picks up quite sharply, with some faint pushing in the front end. Straight-line stability is excellent, and with such a lovely motor, corner-exits are lots of fun. 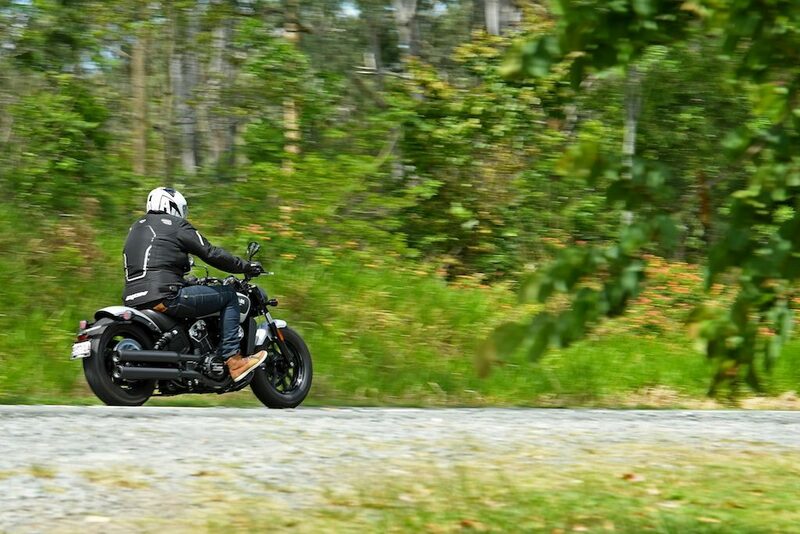 The Scout Bobber undertakes slow-speed manoeuvres surprisingly well. 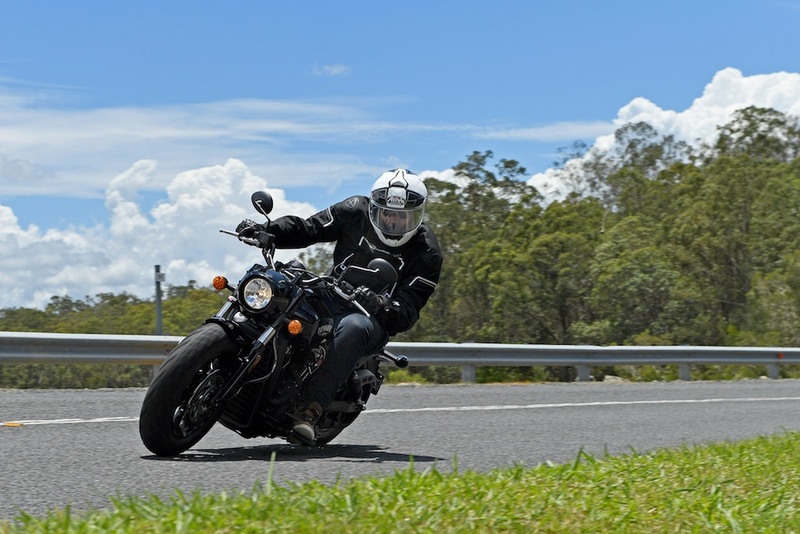 Riders with more experience will feel confident with the handling straight away. 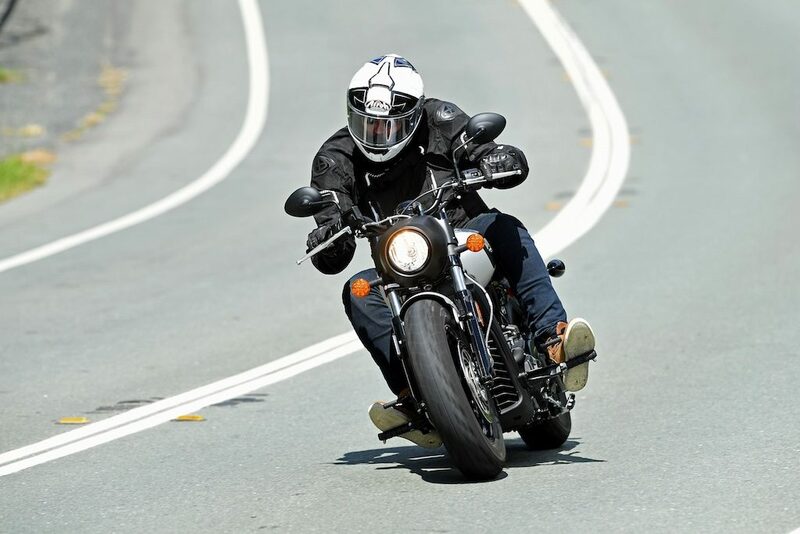 Lane splitting will be possible on the narrow machine, as will sharp U-turns and negotiating traffic with your feet up. Younger riders upgrading to a bigger machine might take some time getting used to the balance and weight of the machine at slow-speeds, while long-legged riders like myself may find their knees bang the bars undertaking U-turns. Be warned – there’s not a lot of cornering availability so you’ll scrape the pegs, although there’s enough clearance to have fun. In 2018 the standard Scout receives Pirelli tyres in response to the feedback received from earlier models, although the Bobber is fitted with chunkier-treaded Kendas for style. While they aren’t the most-suitable road tyres, the Kendas performed fine in the warm, dry test conditions. People ride bobbers because they’re hard machines. In order to ride and enjoy the Bobber you’ll need to be hard, too. A bobber is cool. Complaining about how uncomfortable a bobber is, is not. However, allow me a few words… for objectivity’s sake. It goes without saying the Indian Scout Bobber isn’t the most comfortable motorcycle I’ve ever ridden. The bobber aesthetic is low and long, which creates some compromises. For taller riders like myself, the low seat height and low ground clearance meant a few bashed shins on the footpegs and a few bashed knees on the ‘bars manoeuvring. I also found the sidestand was further back and hard to locate. The seat is appropriately small. That means it becomes tiresome after about 45 minutes of riding. I can see why Indian didn’t push us to do more kilometres. I can’t see Bobber buyers will do much more than that in a day. Otherwise I found the seat to ‘bar distance suitable as was the seat to ‘peg distance. 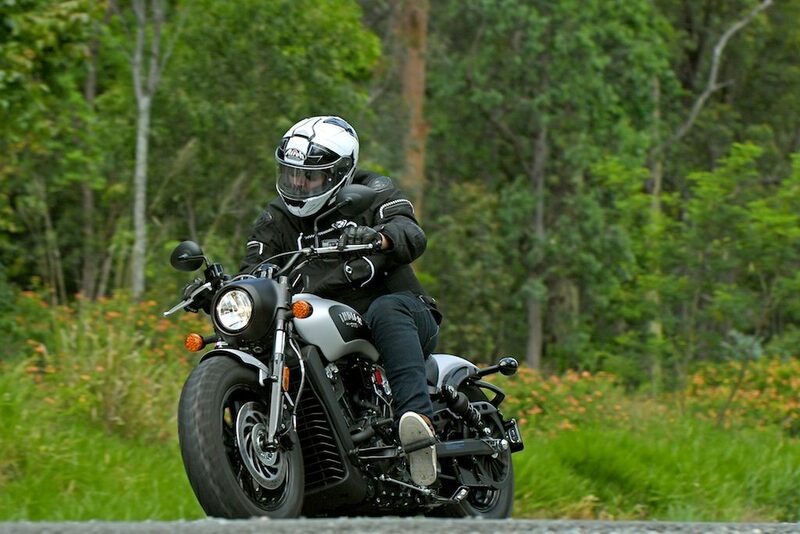 On feet-forward styled machines I tend to cramp around the hips and it didn’t happen once on the Scout Bobber. Overall, the ergonomics aren’t too bad as far as bobbers go and it’s at least on par if not slightly better than similar machines I’ve ridden. The single disc brake up-front with a two piston caliper is fine for cruising, although when pushed harder it starts to feel spongy. I would have liked to see a four-piston caliper used so riders can explore the engine’s potential that little bit more, despite the jeopardy it’d put your licence in. Fork dive would again become a problem, but different shims in the cartridge fork set-up should fix it easily enough. The other option is twin-disc, but that would go against the Indian Motorcycle style guide too much. I found the non-adjustable brake and clutch levers were spot on, single-finger braking was comfortable whilst cruising, and two fingers were needed to haul the bike up quickly. ABS is standard and requires lots of pull on the lever to engage. The rear brake has excellent feel and is partly why slow-speed manoeuvring inspires so much confidence. Again it lacks a bit of power but it’s not as much of a problem for me. 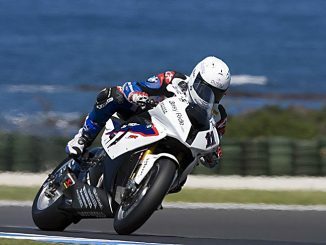 Using the rear brake in tandem with the front will increase overall stopping power too. The other thing I really liked was the light feel of the clutch lever. Considering that it doesn’t have slip and assist functionality, it was nowhere near as heavy as I was expecting for an American machine. The weather forecast prevented me from wearing open-faced helmet and leather jacket. It didn’t take long to get settled-in on the Scout Bobber. Within 15 minutes of riding out of the dealership I could see myself back at home, cruising in and around the city, bar-hopping, riding the esplanades and heading out to the country pub for a counter-lunch on weekends. With an open-faced helmet and leather jacket, no pillion and no worries, I’d just ride. This is also my first experience riding an Indian Motorcycle. The heritage and history of the brand is hard to ignore when you get up-close and personal with the machine. 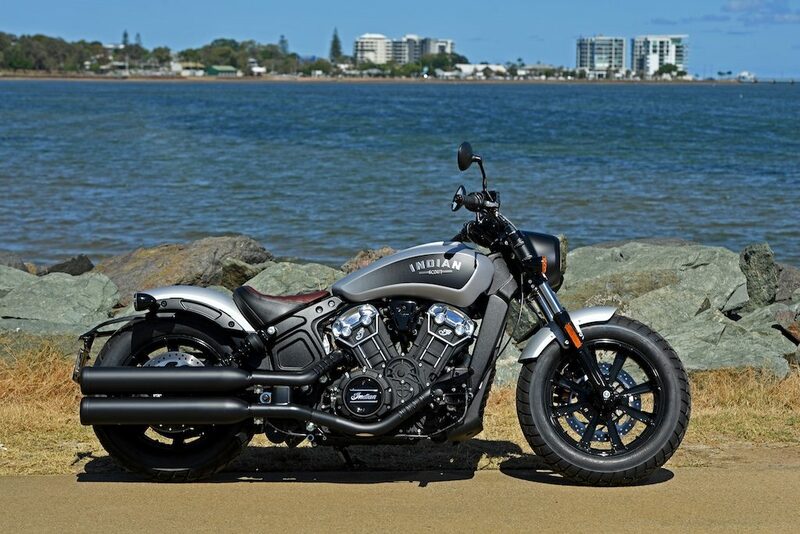 The modern incarnation has a beautiful fit and finish, and for its foibles the Scout Bobber will provide lots of enjoyment to its owners. It may not be the most comfortable or have the best braking package but it goes as well as it steers. While that might not be enough on its own for some, people that love this machine simply will not care. Why? When you combine the experience of riding an Indian Motorcycle built for the harder-edged you really do feel the attitude and nostalgia of riding an American cruiser. And when you do, the Scout Bobber completes a part of your lifestyle that’s lacking.